Burrows, George Washington, now a resident of Breckenridge, Minnesota, was born January 8, 1867 in a log cabin, on a farm on the Iowa river in Franklin County, Iowa, a mile north of the then trading post of Otisville, where is now located the beautiful and thriving town of Dows. The Burrows' homestead, while of log construction, was one of the best in the country at that date, being large and commodious, constructed with the old fashioned fire place and stone chimney built on the exterior of the cabin. Mr. Burrows is of English descent, his father, Chester William Ashford Burrows, and his mother, Jane Gurney, the former born November 3, 1826 and the latter January 4, 1835, being natives of Yorkshire, England. They sailed for America in 1851 on the same vessel, where they made their first acquaintance. The voyage was a very perilous one, the vessel narrowly escaping shipwreck twice, owing to severe storms, and its unsafe condition. It had been condemned from further use, but owing to the rush of emigration, unscrupulous and foolhardy parties conceived the idea of chartering this vessel and making a trip to America and thus enrich themselves by the profits thereof, they succeeding in loading and setting out before the fact was discovered by the authorities; they were six weeks and two days making the voyage. Upon their arrival in this country they settled in Grant County, Wisconsin, where they were afterwards united in marriage. They moved to Iowa in 1866 and settled at Alden in Hardin County, where they remained one year, going from there to Otisville the next year. Their nearest railroad station was then Cedar Falls, where Mr. Burrows used to make frequent trips by team to get supplies and goods for the Otisville store and the neighboring inhabitants; it was fifteen years after Mr. Burrows' settlement in Wright County [sic] before a railroad crossed its borders. A family of six sons and two daughters were born to Mr. and Mrs. Burrows, all of whom are living at present except the second daughter. The father and mother are still living and comfortably settled in their home town of Dows. George Washington is the fifth of the family. He was thirteen years of age before he saw a railroad and train of cars. His first dollar was earned by raising a brood of turkies [sic]. His early boyhood was spent upon the farm and until he was eighteen years of age he put in the farmer boy's usual three months attending the country school in the winter, the balance of the time being required to labor on the farm to assist the family in making a living. By applying himself assiduously to his studies in school and occupying his evenings and spare time when out of school, he fitted himself for teaching at the age of eighteen, when he began teaching in the district schools of his county in winter, continuing his farm labor in the summer. This he continued for three or four years, when he had saved enough from his earnings to pay for a business course. 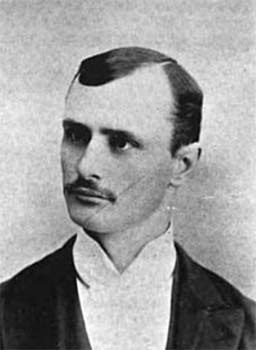 He entered the Iowa Business College at Des Moines in 1888, where he took a course in business training and stenography, graduating in June, 1889. After a short vacation he accepted a position with F. M. Williams, attorney at Iowa Falls, which he resigned the same year to accept a better one with Ellsworth & Jones of the same place, one of the largest real estate and farm loan concerns of the state. He continued his connection with Ellsworth & Jones until the fall of 1892, managing their Chicago office during that summer, when he severed his connection with them to enter the real estate business on his own account at Lake Park, Iowa, in partnership with F. W. Tutin of that place. He continued the business at Lake Park until January 1, 1899, when he sold out to accept the management of the Iowa branch of the Deming Investment Company of Kansas City, Missouri. In the fall of 1899, seeing the rush of emigration to the northwest, Mr. Burrows again left a salaried position and moved to Breckenridge, Minnesota, the county seat of Wilkin County, located at the head of the famous Red River Valley on the Red River of the North, and entered the real estate, loan and abstract business, where he is at present located. Mr. Burrows has always been a student in business, is well posted in business affairs, is successful in his undertaking and held in high regard by his business associates. While not being a member of any church, Mr. Burrows is a strong believer in church work, his tendencies being to the Methodist faith. In politics he has always been a republican, and has held many local offices of trust and responsibility, yet without his seeking. He was on the county central committee during his entire residence in Dickinson County, held the office of town treasurer for two terms and was elected to three successive terms as mayor of Lake Park; he enjoys matters political, is a hard worker for the success of his friends and party, but has never aspired to office himself. Mr. Burrows is a strong advocate of clean government and is a public spirited citizen; he is well connected socially and is prominent in all movements for the upbuilding and maintenance of good society and high morals, and will be found a helpful addition and moving spirit in any community in which he may locate. Mr. Burrows was married December 25, 1895 to Pearl Maude Ring, second daughter of Captain and Mrs. E. P. Ring of Lake Park. Two daughters have been born to them: Hazel May was born April 21, 1897 and died April 22, 1897. Lucelia Ring was born May 16, 1898.